Porsche is less than six months away from the launch of its fastest and most technologically advanced 911 yet. The new eighth-generation model, which uses the internal codename 992, is set to make its public premiere at the Los Angeles motor show in November before going on sale in the UK early next year in initial rear-wheel-drive Carrera and Carrera S guises. Further new 911 models will follow throughout 2019, including an advanced new four-wheel-drive Turbo, which insiders at Porsche’s Stuttgart headquarters suggest will make as much as 600bhp in range-topping S form, giving it the same output as the limited-edition 911 Turbo S Exclusive launched last year. The 20bhp increase in output over the current 911 Turbo S is said to combine with developments to the four- wheel-drive transmission and improved aerodynamics to give the new model a 0-62mph time of less than 2.9sec and a top speed beyond the 205mph of its predecessor. The new 911, which is claimed to offer a significant advance in structural engineering, introduces a newly developed platform that has been conceived to provide the basis for the third-generation Audi R8 and the successor to the Lamborghini Huracán. There have been conflicts between the three companies concerning the mounting of the fuel tank, which sits up front in the 911 but at the rear of the cabin in the R8 and Huracán. However, it is understood that the new platform consists of a series of interchangeable modules in an overall matrix that will allow the three Volkswagen Group models to share a number of key components and enjoy greater economies of scale. In a development aimed at keeping the kerb weight close to the 1430kg of the manual version of today’s 911 Carrera, the new model also adopts an inner structure possessing a greater percentage of aluminium than that of its predecessor, most notably within the side sections. Although not made up exclusively of aluminium, the structure uses a new generation of hot-formed high-strength steel employed in varying thicknesses, a process known as tailored blanks, within the floorpan for increased strength. The structure, which has been developed in partnership with Bertrandt, a company Porsche has used for the development of all its recent models, is also claimed to bring greater levels of static stiffness and dynamic rigidity than those of today’s 911 models. Despite the developments to its platform and body structure, added equipment levels and incremental increases in dimensions mean the new 911 is unlikely to benefit from a significant reduction in kerb weight. Also unclear at this stage is whether Porsche will equip standard versions with the lithium ion battery that, up until now, has been reserved for track-focused 911 models in place of a more traditional and heavier lead-acid battery. The styling of the new 911 is little changed. 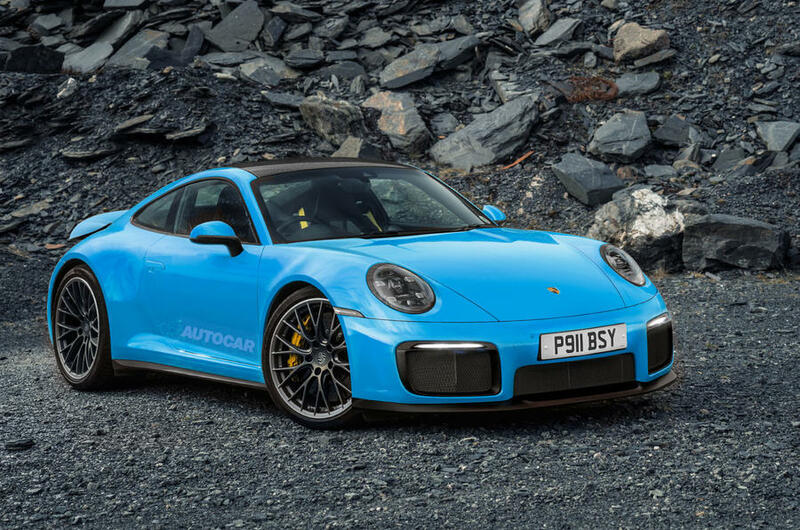 The new model was initially previewed in a series of photographs depicting a disguised prototype of the 2018-model-year 911 issued in February. It follows an evolutionary path with a continuation of the customary look that has characterised the Porsche model through the years, albeit with some subtle modifications over its direct predecessor. Included is a redesigned front end featuring a new-look bumper with altered air duct channelling, revised headlights that sit more upright and sport a new take on the four-element LED graphics adopted on all Porsche models, and reshaped front wings. Further back, new door handles sit more flush with the bodywork and the rear haunches are more pronounced. The rear also adopts the full-width tail- light design of other recently launched Porsche models. The new 911 also adopts a number of active aerodynamic features, including louvres within the front air ducts and a new rear spoiler claimed to provide improved downforce. Dimensionally, the new Porsche is said to have grown. Official figures remain under wraps, but sources suggest that its length is up by around 20mm and overall width has increased to accommodate a rear track of 1850mm. Changes to the interior are perhaps more comprehensive than those made to the exterior, with a new digital instrument panel, touch-operated switchgear and Porsche’s latest touchscreen infotainment system all featuring in a cabin that is claimed to be roomier than ever before. The platform of the new 911 is said to position the engine more inboard than in any previous generation for improved weight distribution. Along with passive mounts on lower-end models, Porsche will continue to equip the more powerful models with dynamic mounts to help suppress movement of the engine’s mass under load for more neutral handling. The existing turbocharged 3.0-litre horizontally opposed six-cylinder engine will be retained for the Carrera and Carrera S. It adopts a number of changes to improve performance while reducing CO2 emissions, including altered turbocharger geometry and a new particulate filter. In the Carrera, power output is said to increase by around 20bhp to 390bhp. With added turbo boost and other minor tweaks, the Carrera S is likely to make up to 450bhp, some 30bhp more than today’s model. Both units are said to have undergone a weight optimising process, although the reductions are described as ‘incremental’. Early rumours suggesting the new 911 may use a powered-up version of the 2.5-litre horizontally opposed four-cylinder engine used by the Boxster and Cayman have been denied by Porsche, quashing any idea of a return of the 912 – the original four-cylinder 1.6-litre 911 produced between 1965 and 1969 and resurrected between 1975 and 1976 with a 2.0-litre powerplant at the height of the oil crisis. Indications are that the eighth-generation 911 could be the first to be launched without a single naturally aspirated engine in the line-up. Officials won’t comment on whether the next GT3 will switch to forced induction, but sources within Porsche’s Motorsport department confirm studies are being carried out on an evolution of the next 911 Turbo’s twin-turbocharged 3.8-litre flat six engine conceived for motorsport activities. What is certain is that the new 911 has been engineered to run a petrol-electric plug-in hybrid powertrain. 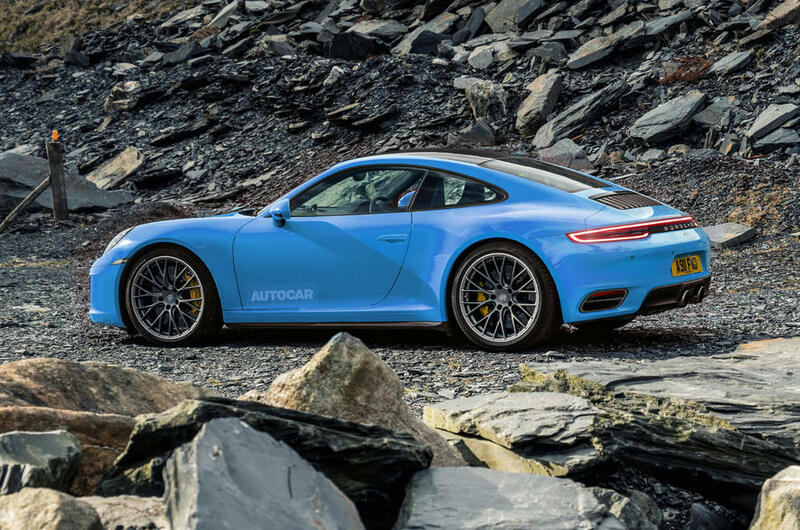 Although not expected to be offered until closer to a planned facelift for the upcoming 992 in 2022,the new system will combine the Carrera’s turbocharged 3.0-litre six-cylinder engine with an electric motor for a predicted combined output close to 500bhp. The new plug-in hybrid powertrain is said to use a lithium ion battery with cell technology more advanced than that used by plug-in hybrid variants of the second-generation Panamera and a capacity of around 11kWh. As with the existing 911, the new model will be offered with the choice of either a seven-speed manual or seven-speed dual-clutch automatic gearbox, the latter said to boast new developments aimed at improving its already rapid gear-shifting ability while increasing efficiency through its improved stop-start, coasting and brake energy recuperation functions. Also set to be included on the new 911 are the carbide-steel brakes that first appeared on the new third-generation Cayenne SUV. Do I have the last proper 911? A manual 991.1 C2 Coupe. I think every generation probably thinks they have the last proper 911. "Dimensionally, the new Porsche is said to have grown"
Agree. Front looks like someone fitted a GT2 bumper to mine. But it is only an autocar render not Porsche’s own ? Ragpicker's comments sum up what immediately came into my mind when I read the article. While we may accept that Porsche needed to do something to survive financially in the mid 1990's it lost its soul & its ethos. It is no longer a small niche sports car manufacturer of well engineered & built sports cars. Its a medium volume manufacturer of up market SUV & saloon vehicles of average build quality & built to a budget. It has long been known its electrics & air con units are sources from the VW/Audi Group "parts bin" & now it looks like their iconic vehicle will share its underpinnings with other brands save the petrol tank is in a different place. It has the audacity to trade on a heritage of individuality & engineering excellence that bears no relationship to what it has become. Is that a rendering or the actual car? Looks very nice. Lots of GT2 in that front bumper and coke bottle in the design with those wide hips. What are you getting out of remapped 991.1 2 turbo s? Stock 60-130mph is 7.5 secs. 100-150mph is also 7.5 secs. Thats pretty quick out of the box! I agree this looks awfully similar to the current model. Not wowed in the slightest.